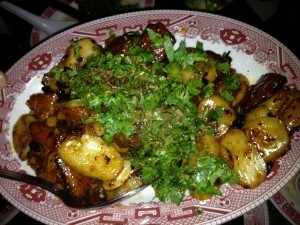 Mission Chinese is a tiny (41 seat) with only a couple of reservations available. But don’t preoccupy yourself with trying to get one because you probably won’t. You’ll just have to get in line with the rest of us. Luckily, that line has free beer. 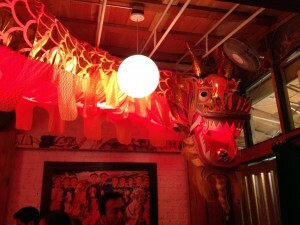 Once your long wait is up, down a few steps, through a curtain and the kitchen, you are greeted by a giant dragon head and red tinted lighting. This room isn’t so much “dining room” as a place that has seats to eat. The benches are all made out of ply wood and not much has been done to charm the place up, which in a backwards way, actually kind of gives it some charm. Mission is orginally from San Francisco and had an interesting start. A husband and wife team started with a food truck cooking Chinese inspired food that was so popular they needed to expand. 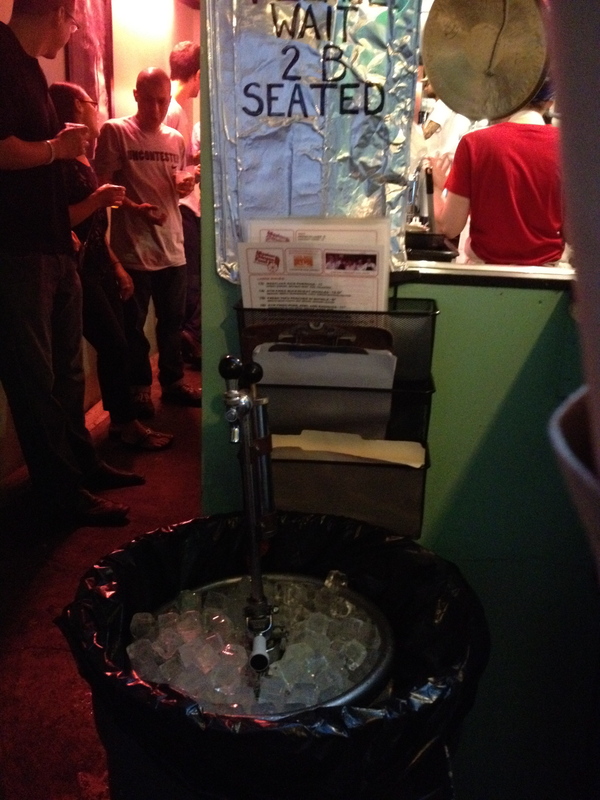 They began taking over kitchens doing pop ups twice a week at different restaurants throughout the city. 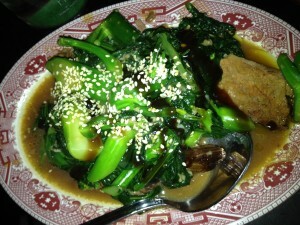 In an interview, Chef Bowien called the restaurant’s cuisine “whimsical Chinese.” “It’s not fine dining. It’s not authentic. It’s not from one region. We’re just trying to do everything backwards.” [Credit: Daniel Krieger for The New York Times] Mission became so popular that they opened an outpost in NYC’s Lower East Side. Mission might also be one of the most affordable meals I have had in recent memory. Our entire meal for 3 people was about $100 which in NYC is quite a bargain. The restaurant also gives 75 cents to a food bank for each entree it sells. My friends and I wanted the full experience so we decided to order some of the spicier dishes as well as some that would cut the heat. I also ordered a Great Northern cocktail which definitely helped to cut the heat. This was a mixture of grapefruit juice, yuzu, soju, and sparkling wine. Really they had me at yuzu. If this is too sweet for you, it’s probably better to just stick with beer. We started with two little bowls, one of Beijing vinegar peanuts with smoked garlic, anise and rock sugar and the other of smashed cucumbers with salted chili, sesame paste and garlic. 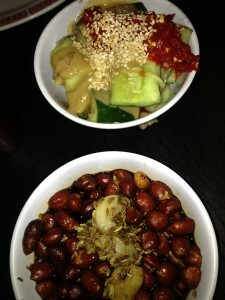 These were both very interesting and just made us hungrier for the larger dishes. Next was a version of chawanmushi, a duck-flavored egg custard topped with raw scallop, a little julienned green apple, salmon roe, basil seeds and shizo leaf. The fresh ingredients on top provided a nice contrast to the thick, creamy custard and it was very interesting having a cold version as these are normally served hot. Next our main dishes came out. 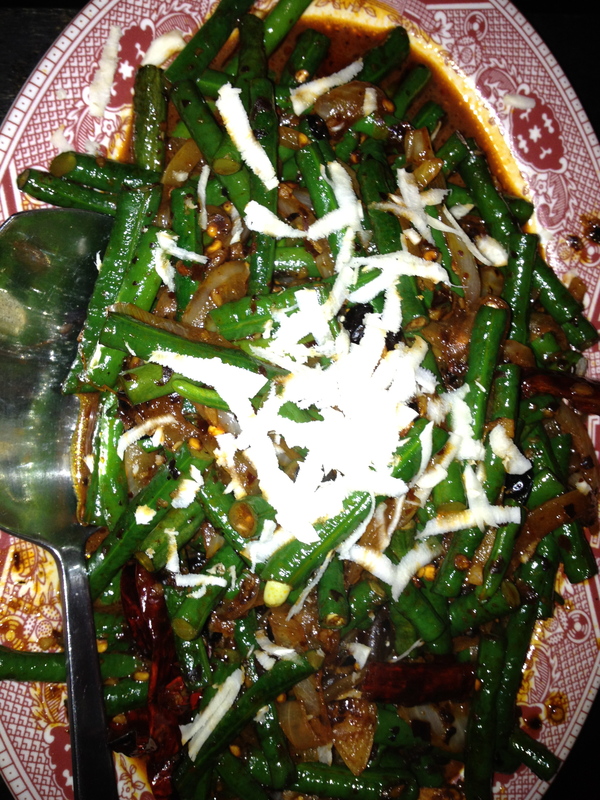 The Mongolian long beans with roasted chili, horseradish and chili oil were one of the spicy dishes we ordered which had two flames next to it on the menu which signified the highest level of heat. I personally love spicy food but these were pretty intense. The heat was a smoldering heat that developed and got hotter the more you ate the dish. These were good but make sure to have some rice on hand. 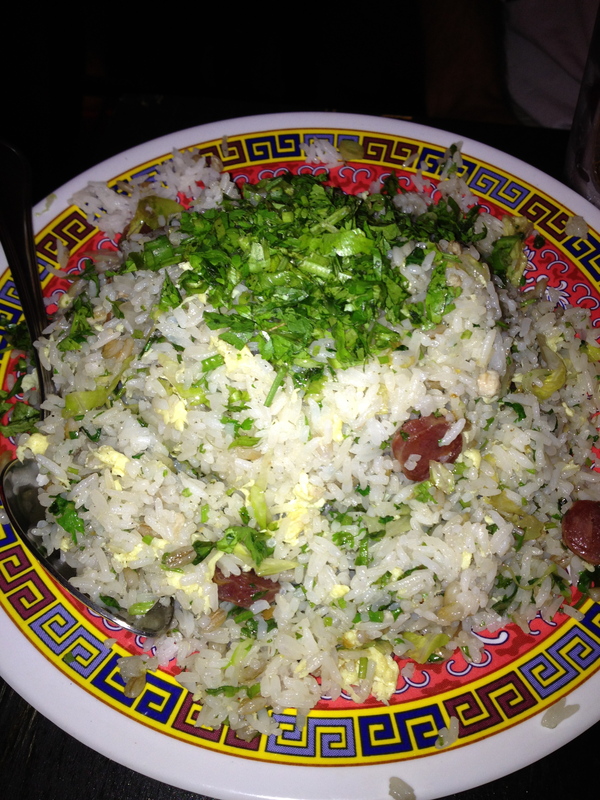 The rice we ordered was a salt cod fried rice which had slow poked mackerel, some chinese sausage and egg. The rice very much had a dry fishy flavor that you might find in Malaysian cuisine but also had your traditional fried rice flavor. 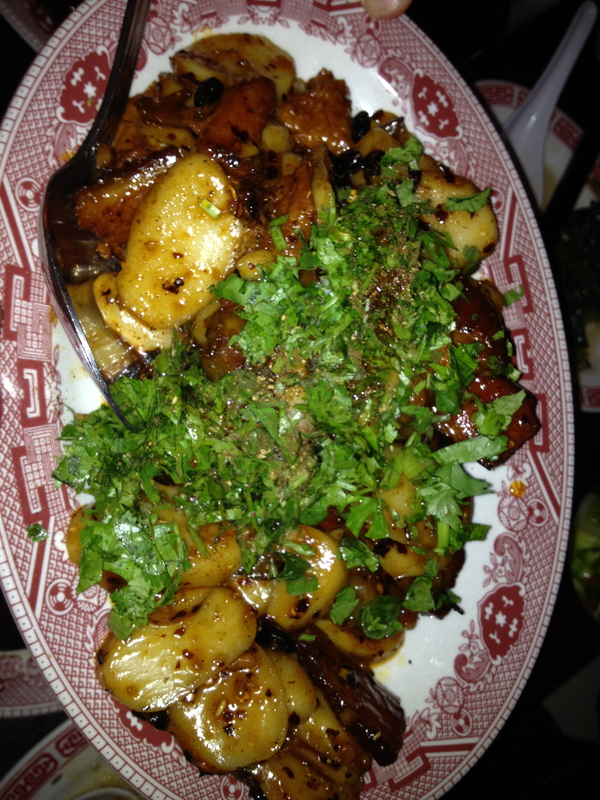 The other spicy dish we had was the thrice cooked bacon with Shanghainese rice cakes, tofu skin, bitter melon and chili oil. This dish was even more insanely hot than the last and even the rice cakes, which had a rice flavor but a chewy texture almost like a hardened jello, could do little to cool this one down. The big chunks of bacon were meaty but easily confused with a giant whole chili. Try this dish if you dare. 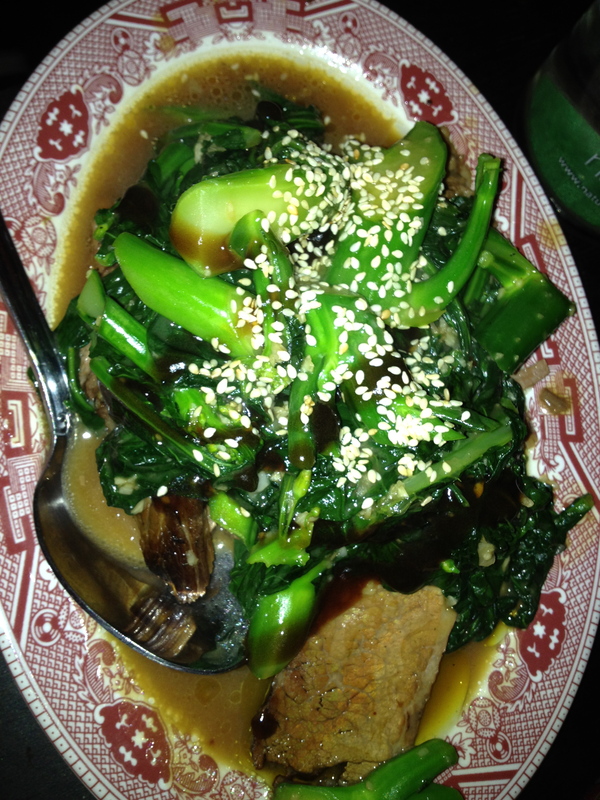 We had one more demure dish to add to the mis which was the broccoli beef brisket with smoked oyster sauce which provided some relief to the mouth. 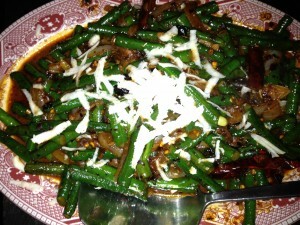 This was also a nice dish to add some vegetables to the meal. 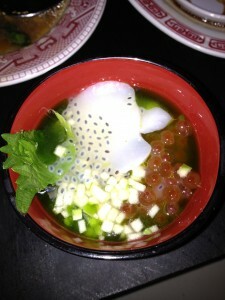 Overall Mission is a really fun experience, the food is interesting and unlike anything I’ve ever had before. While it is definitely worth it to go once, I don’t think that I will be craving any of these dishes when I really want Chinese food although I did make myself a few nice little to-go containers which lasted for a few days afterwards.